Yesterday’s Story . . . Demise of . . . The morning at Powdermill Nature Reserve was happily beautiful. This birding research station, part of the Carnegie Museum of Natural History, spans several thousand acres in the lush Laurel highlands of Pennsylvania. The summer night had been humid, and dew covered almost everything. I had come to photograph butterflies, but I knew that spiders were now present in good numbers, and the expansive webs of argiopes were numerous. This was a sad sight, though. 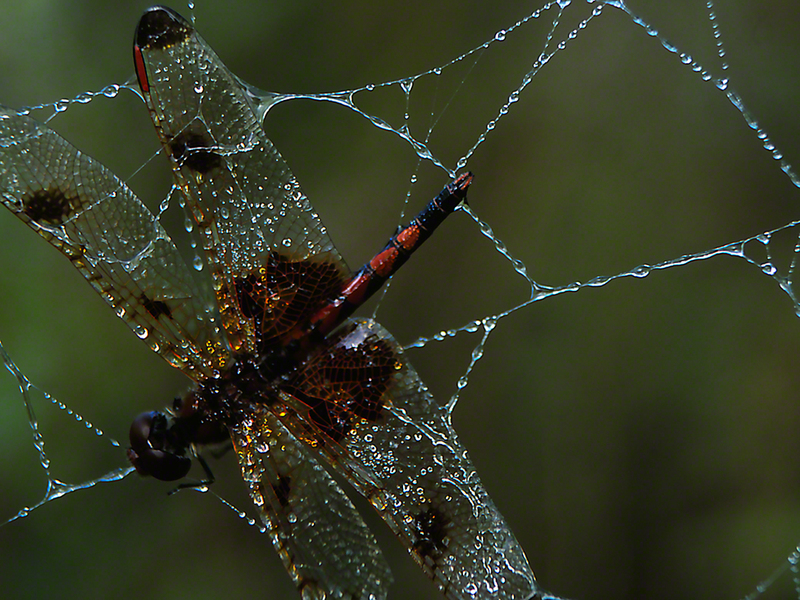 An Elisa Skimmer (Celithemis elisa) had flown into an argiope web the day before, and this morning remained very much dead, covered with dew, and as with so many things, gave me pause, and made me sad. Why the demise of this magnificent creature saddened me? Beauty and grace on the wing…no more. Just it’s name, Elisa. Such an aptly named darner (dragonfly, if you wish). Once you’ve experienced death within your personal circle, death becomes …. My copy of National Audubon Society Field Guide to North American Insects and Spiders notes that Elisa skimmers are “widely distributed…but seldom becomes abundant.” Here we are reminded that wild populations have many outside forces that insure that they rarely become too numerous. Those childhood concerns that this spider or that silverfish or those flies will take over the world overlook the complexity of this amazing planet. A sad photo, but it is sad-beautiful. Dead saddens us, but the dewdrops symbolizes a new morning. And therefore hope.